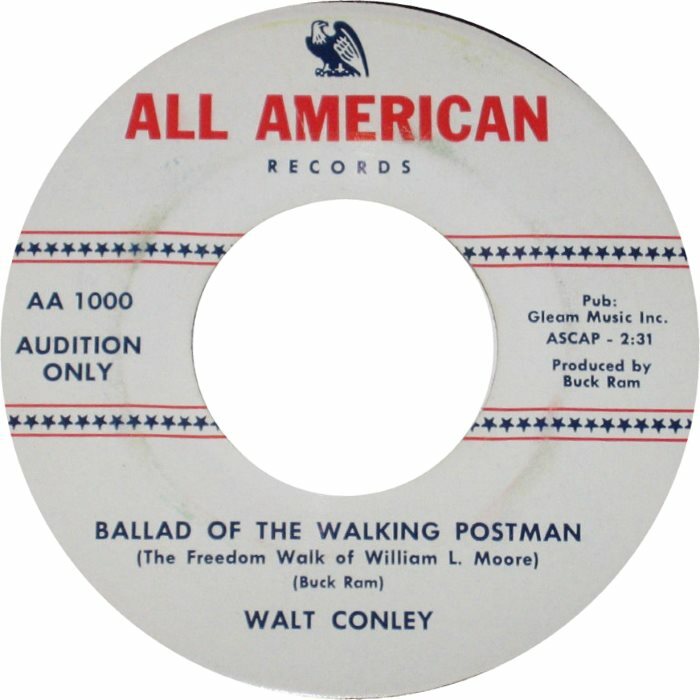 I tracked down Band Box recording artists Walt Conley. He was among the earliest recording artists on the Denver label. 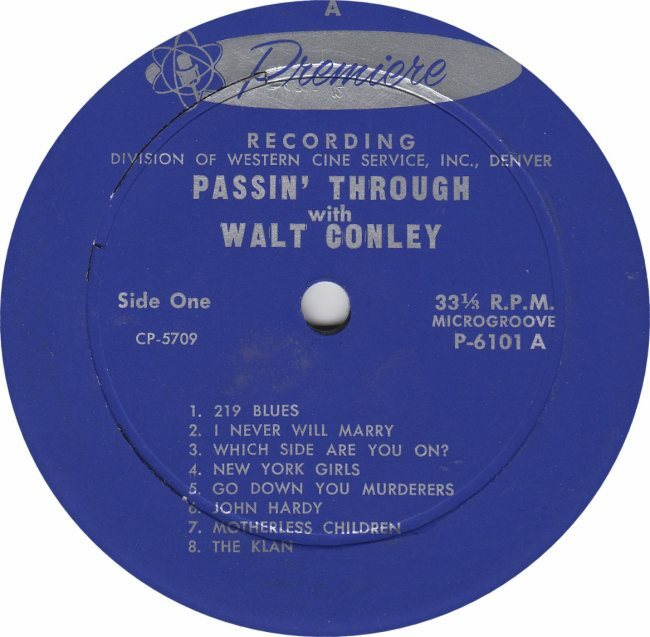 Breaking away from stereotypes, Walt was a premiere folk singer who over the years met and performed with Judy Collins at Michael’s Pub in Boulder, Colorado. In 1991Walt would become a regular, performing at the Sheabeen Pub where he performed Irish folk music. 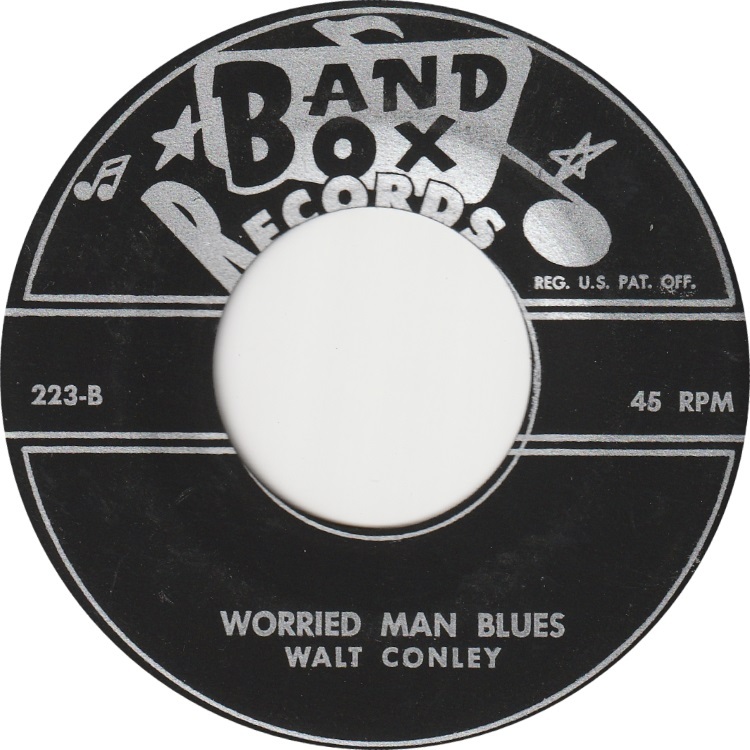 Walt had two Band Box releases in the 45 format. 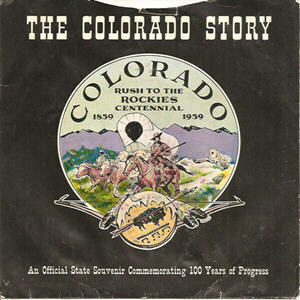 Catalog number 222 “Colorado Story” was a Colorado Centennial year tribute to the state. 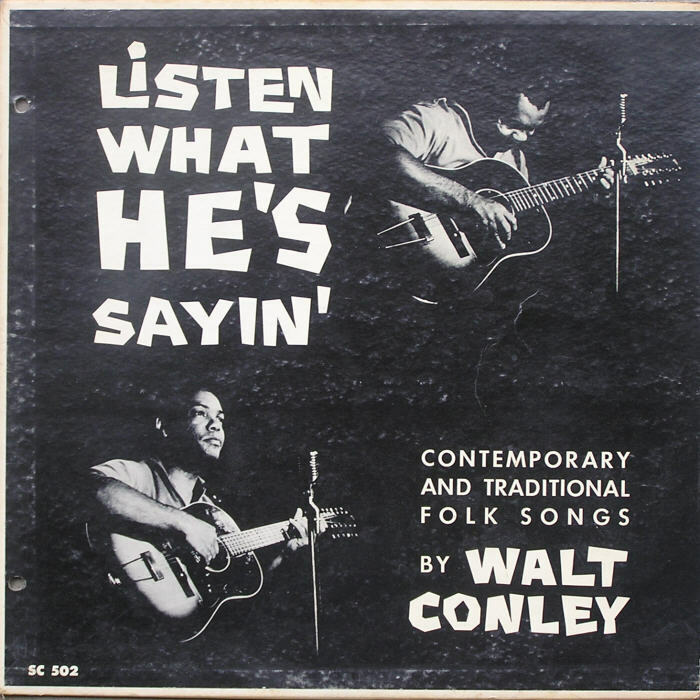 The single came packaged in a graphic sleeve (illustrated below). 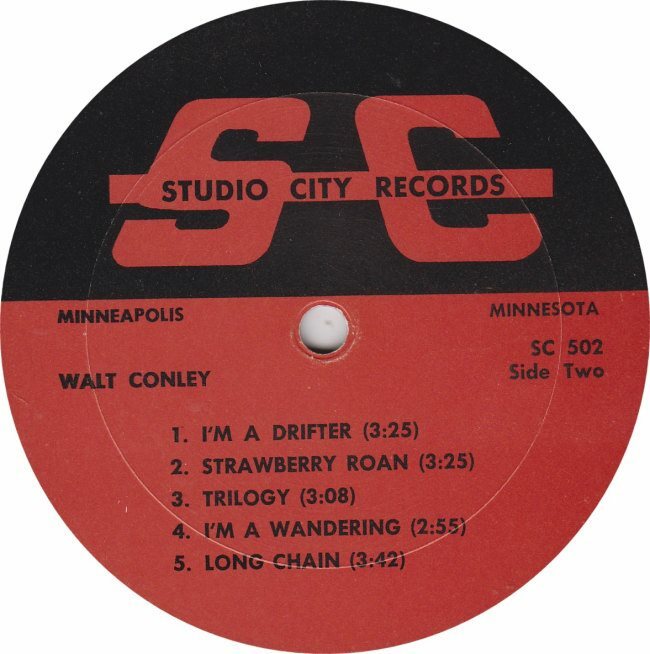 Here is an excellent web site feature presenting an in-depth look at the life and career of Walt Conley. Walt passed away in 2006. Walt was born in 1929 in Denver, Colorado and spent much of his growing up years in Scottsbluff, Nebraska. Walt returned to Denver at the age of 15 where he entered Denver Manual High School. Walt served in the Korean War in the U.S. Navy. After the service he attended Colorado State College and graduated in 1957. Walt performed regularly around the Colorado Front Range including Denver’s Exodus and Satire lounges, Michael’s Pub in Boulder and of course later at Sheabeen’s Pub. He hosted his own radio show on KDEN and made guest appearances on KFML and KLZ – all based in Denver. He also appeared on TV in the KOA series “En Route”. Walt made his way to California in the early 1970’s to pursue his interest in acting. He landed some supporting roles in television shows such as “The Six Million Dollar Man”, “The Rockford Files”, “Get Christy Love” and others as well as a couple of motion pictures. This group was formed around 1983 when Walt returned to Denver and opened a club called “Conley’s Notalgia”. Conley fronted the group along with Tony McAleavey, bass player Clark Burch, Michael Kent and Frank Moore. Next, McAleavey opened his own club the “Sheabcen Pub” in 1991 where Walt would perform into the 21st Century. At “Sheabcen’s” Conley formed “Conley & Company” with McAleavey and Kent from “Juice” along with guitarist Ted Sherman. When Sherman departed, the band morphed into an Irish combo. At this point they were joined by bass player Carl Brunell who later departed and was replaced by school teacher Bill O’Donnell. The group was finally rounded out by fiddle player Susie Lewis. “I was Walt Conley’s guitar player from 1959 to 1961, playing at Michael’s Pub, the Exodus, and the Satire. We continued to jam at the Fort Restaurant in Morrison until his death. Michael’s in Boulder closed down in ’61, never to reopen, but the Exodus and the Satire went on for many years. Walt and I were backup acts to Josh White, Cisco Houston, and the Smothers Brothers, in addition to recording with Judy Collins, the Harlin Trio, and others in 1959, Folk Song Festival at Exodus. “I was also on one of his singles, Colorado, Queen of the West, and played guitar behind him on his Premiere LP in ’61. We also did a concert with others at the UMC Ballroom at CU in ’59, when I recorded Rosita Alvirez, a Mexican folksong. A retired Spanish teacher, I currently still work as a substitute in the Boulder schools, and play guitar there whenever the occasion demands. “The Band Box recording Walt and I made was at a private home, (this was the home of Band Box owner Vicky Morosan). The harmonica player was named Paul, can’t recall his last name. 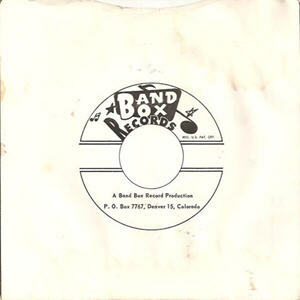 I have a copy of the (Band Box) 45 (“Colorado Story”) and the Premiere recording (Premiere LP shown below). I saw at Arvada’s Black and Read, that there was one in a bin they were asking $7 for. I no longer have the jacket of the Exodus recording in fall ’59, but have it somewhere here on cassette tape. I still have the J-200 Gibson I used with Walt, though the BB recording was with a ’58 J-45 I sold later when I bought the 200. I believe Gary Stites and the Satellites were on Band Box, and I met Jimmy Acker, their guitar player at the Exodus. I Haven’t seen Ted Sherman in a while, and he came after (as guitar player with the Satellites), though we’ve jammed in the past 20 years on occasion. Western Cine is where the Premier LP was recorded as well and may have been where Conley and Wood recorded their Band Box two Band Box singles. David is listed on the “Passin’ Through” LP on three tracks and may have accompanied on all. 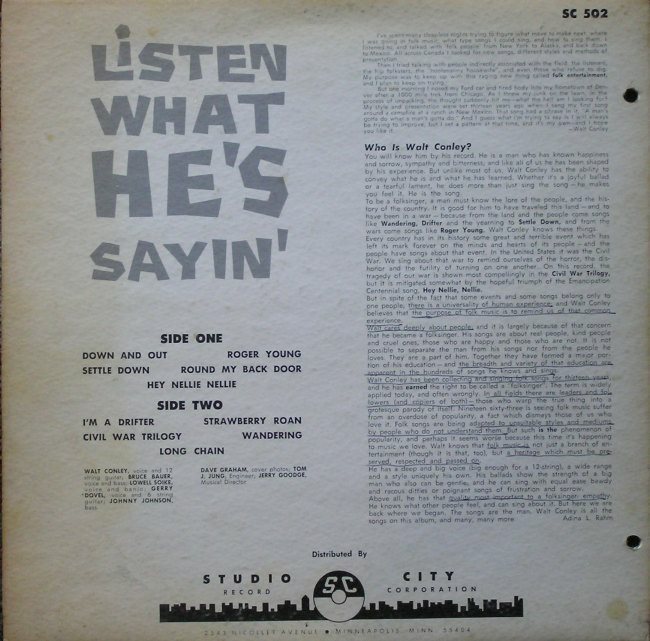 “My Father, John Newell, was the President and key founder of Western Cine (then a full service film lab), where “Passin’ Through” was recorded on the Premiere label in ’61. I recall meeting Walt in the studio around the time I was in grade school. My father was very fond of him, quite impressed by both his talent and his intellect. He lamented his falling out of touch with Walt over the years. Walt resonated with me – the richness of his voice, the glow of his smile. Such warmth. Such soul. Search a bit around the internet and read some interesting observations by Walt relating to Bob Dylan’s early presence in Denver. thanks – will note that – I’m 67 – way too young to have been there ! I was Walt Conley’s guitar player from 1959 to 1961, playing at Michael’s Pub, the Exodus, and the Satire. We continued to jam at the Fort Restaurant in Morrison until his death. Michael’s in Boulder closed down in ’61, never to reopen, but the Exodus and the Satire went on for many years. Walt and I were backup acts to Josh White, Cisco Houston, and the Smothers Brothers, in addition to recording with Judy Collins, the Harlin Trio, and others in 1959, Folk Song Festival at Exodus. I was also on one of his singles, Colorado, Queen of the West, and played guitar behind him on his Premiere LP in ’61. We also did a concert with others at the UMC Ballroom at CU in ’59, when I recorded Rosita Alvirez, a Mexican folksong. A retired Spanish teacher, I currently still work as a substitute in the Boulder schools, and play guitar there whenever the occasion demands. Thanks so much for the wonderful information on Walt (and yourself)! Have not yet been successful getting through via email but will keep trying – In the meantime if you read this – would love to have some photos from your early days (and now) to place on the site along with Walt Conley. Near as I can tell the Band Box recording of “Colorado Story (Band Box No.222) on which you accompanied – is one of the very earliest releases on that label. Do you recall what studio you recorded that in? I believe it pre-dated the Band Box studio on Sheridan. Do you have any recollections of Band Box owner Vicky Morosan? Was she in the studio when “Colorado Story” was recorded? I looked at my copy of the LP “Passin’ Through with Walt Conley” on the Denver “Premiere” label – I see your guitar credits throughout the tracks! 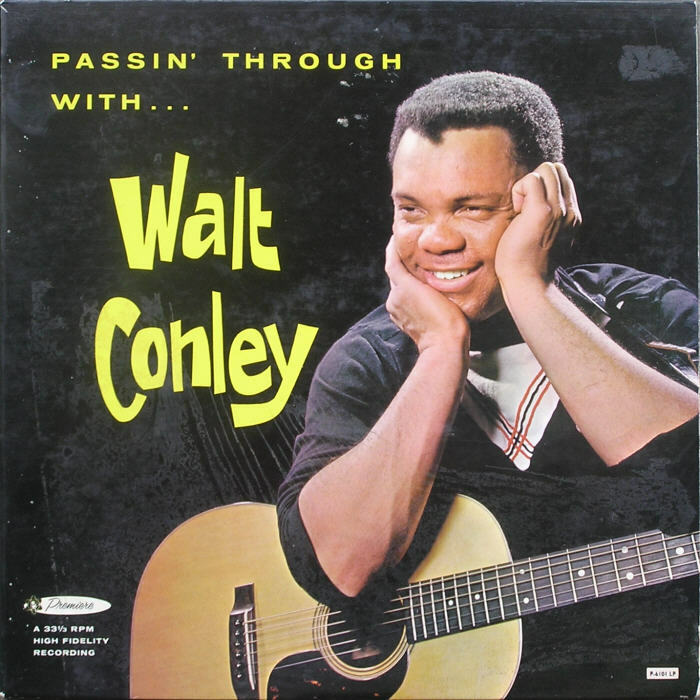 My Father, John Newell, was the President and key founder of Western Cine (then a full service film lab), where “Passin’ Through” was recorded on the Premiere label in ’61. I recall meeting Walt in the studio around the time I was in grade school. My father was very fond of him, quite impressed by both his talent and his intellect. He lamented his falling out of touch with Walt over the years. Walt resonated with me – the richness of his voice, the glow of his smile. Such warmth. Such soul. In clearing out the family house, I ran across a couple copies of “Passin’ Through.” The covers are in much better shape than those photographed for this site. The records are playable. If someone out there would like to have one, let me know. And I certainly recall the film, Colorado Legend (referenced in one of the comments), for which Walt provided the music. I’d intended to salvage a print when the lab closed down, but I never ran across one. It is actually also a notable film for the involvement of Colorado’s legendary experimental film artist, Stan Brakhage, who used Western Cine as his laboratory. 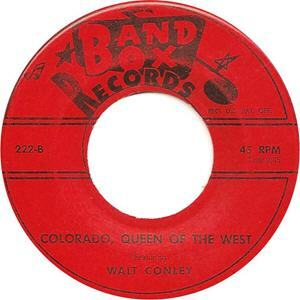 Thanks for the information on Walt and Western Cine – I run across many Western Cine recordings – I will post this and add it to the Denver timeline as well! Ran across Scott Newell’s reply. 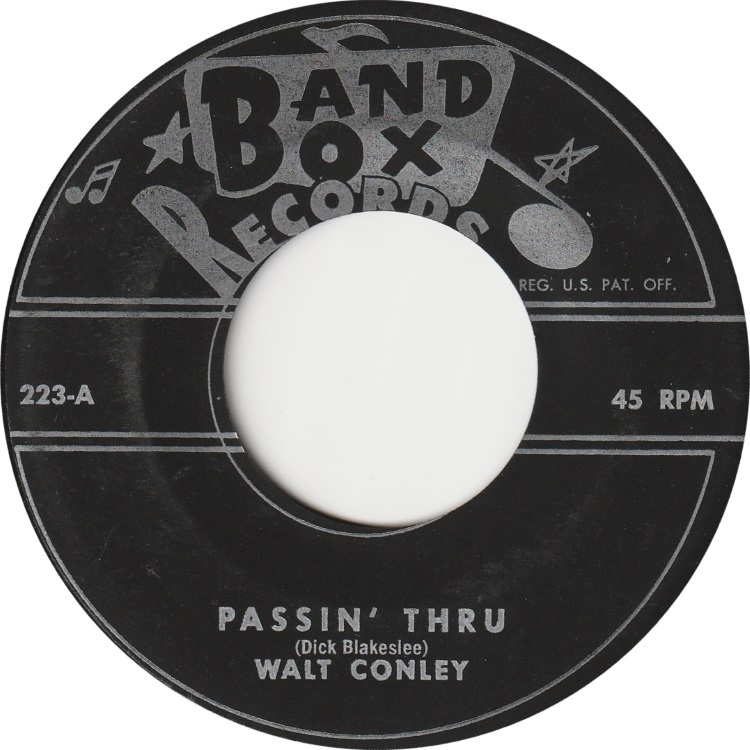 My father, Marshall Faber, photographed the cover of “Passin’ Through” for Walt Conley. I think I wore the record out listening to it. My father also helped Johnnie Newell with the chemical processes at Western Cine. Dad had been in the motion picture business since about 1934, and did a lot of experimenting with color film when it was in its infancy. He shot most of the commercials for Channel 9 (then KBTV, now KUSA) and was the chief news photographer, in addition to being in charge of the physical plant. I think the original photos of Walt were lost in the Cherry Creek flood of 1965. Is Western Cine still in business? I believe Western Cine is gone. I had WC do some film production work for a few industrial companies I worked for in the 1970’s and 1980’s but that was the last time I was in touch with them. Seems at that time that their studio was on Alameda. Thanks for the input – which I will place with Walt Conley’s spot on my site and also a Western Cine Entry. I was Walt’s bass player (in the band Conley & Company) from about 1996 or 1997 until his untimely death in 2003. During that time, Walt’s band recorded two live CDs of Irish music. 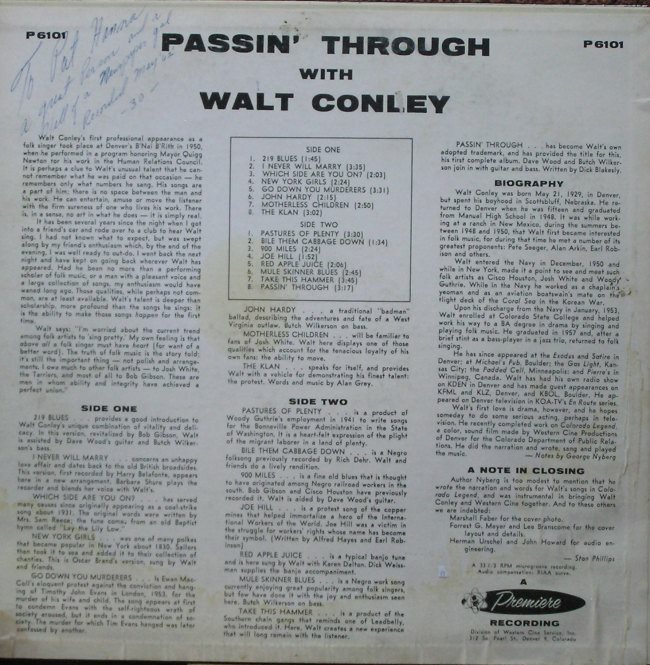 Walt also left an unfinished scratch vocal track of the Irish song Molly Malone. With the help of my current band members–who never knew Walt–we were able to finish the track and include it on the band’s latest CD. Each year since his death, a fundraiser for the American Diabetes Association has been held in November in Walt’s name at the Sheabeen Irish Pub in Aurora. I would like to acquire one of the albums Scott Newell mentioned in his post. If he is watching this thread, Please contact me, Scott. Interesting reading, I’m Walt’s oldest son and it’s kinda neat to follow this conversation about my father. Hi Joel, thrilled to see that you responded to this blog post. I am leading the development of an exhibit at the History Colorado Center in Denver that explored the history of popular music in Colorado. We want to highlight Walt in the exhibit and would love to talk to you about your dad. You (or anyone else who knew Walt and is interested in helping us out) can contact me at megan.friedel[at]state.co.us. Hope you see this! Thanks Kathleen – Your comment is posted!